Let me just say upfront that I have only tried one indie brand so far. Rainbow Honey was a brand that I had seen on a lot of other blogs and was all over my Instagram. It took a long time for me to take the plunge and finally order. There was definitely a little trepidation there at first. But I ordered, fell in love, and ended up subscribing to their monthly Mystery Bag. And then I went back into my little mainstream shell. I've been hesitant to come back out. The thing is, I could blame not buying indie on a gazillion different things. I do have a mainstream fave. I like shopping in brick and mortar stores. Online re-stocks are frustrating. The price tag is a little intimidating. The polish might not look the same in person as it does in the pics. But isn't that the sometimes truth behind most new nail polish... mainstream AND indie? Yes. It really, actually, 100% is. And if that's my way of thinking about it, than my actions should probably match that frame of thought, right? I mean, I try new things all the time. It happens all the time with new foods and fashion trends. I survived becoming a parent and all the crazy changes that go with that. I try new mainstream brands of nail polish. Why not indie nail polish brands? I'm not talking about going crazy and ordering all the polishes on my wishlist. I can't afford that at all. But I am going to try and branch out a little bit. My toes can definitely stand to get a little more wet! I placed an order yesterday for a couple of polishes and bath products from what will be my 2nd indie brand. I'm excited to give them a try, and I can't wait to share that with you! Let's be brave together, shall we? Now, getting back to the original point of this post. 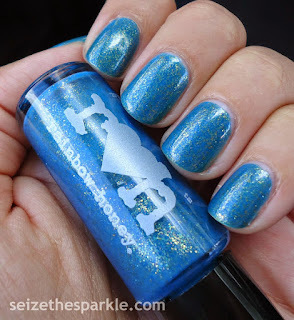 Rainbow Honey is the first independent polish brand I tried. They're based out of New Jersey, just a skip over the state line from the good old Keystone State. Their polishes are Big 3 Free and Vegan. They've got a decent spread of colors and finish types to choose from, with Limited Edition Collections coming out regularly. I tend to favor shimmers, glitter top coats, and jellies. Most of my Rainbow Honey polishes came from the Monthly Mystery Bag. I get the mini-size for $10.00/month+shipping, but there is a full size that's $25.00/month+shipping. Each bag typically has 2-3 polishes and various bath/body products. In addition to nail polish, Rainbow Honey makes ah-mazing cuticle balms, oils, perfumes, lotions, and soaps. Summer Juice and Royal Fruits are my favorite scents! December of last year brought Woland in my Mystery Bag. 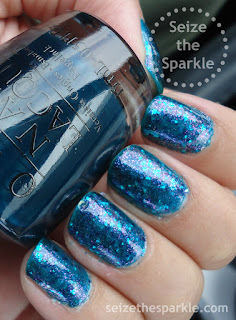 It's a gorgeous glitter topper! I layered it over a muted lavender for Fishbowl Friday 007. April came and I learned about Seriotypes and began my quest to Seriotype all the things. 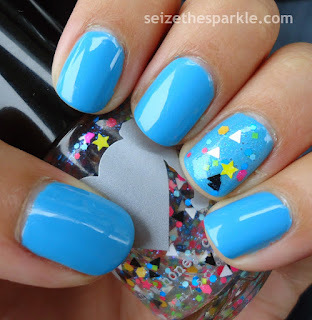 It's actually really fun trying to use all the polishes from the Mystery Bag in the same manicure. Challenging, but fun! Rainbow Honey nail polishes are sold in their online store. The shop does go down for restocks around the end of the month, but be patient. They'll open back up, and there's usually a note listing the specific date, sometimes even the time. Mystery Bag subscriptions are almost always available, or you can buy the current month's mystery bag outright. Previous months are usually available for a limited time, too. Follow Rainbow Honey on Facebook, Instagram, and Twitter for news and specials! Like I said above, I've already ordered from my 2nd indie brand. Any recommendations on what brands I should try next? Let me know in the comments! 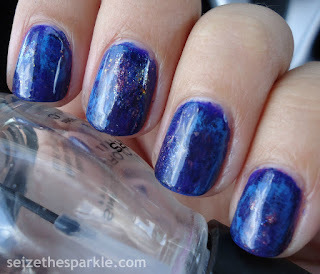 I think it was my love of layering polishes that made me write prompts for more than 2 colors. Taking that beyond 5, well... I do love a good challenge. I mean, it's always more interesting to do things the hard way, right? 8 COLORS pretty much guaranteed that this manicure was going to be Galaxy related or a Seriotype. In the beginning, I was thinking purple galaxies. Then I started thinking Seriotype about halfway through. Vibrant Galaxies, Subtle Seriotype. This mani really turned into a hybrid of the two. Galatype? Serioxy? Whatever you want to call it, I'm really loving how this turned out. I especially love what The Uptown brought to this nail party. Color-shifting shimmer and flakes really add to the overall awesomeness of this manicure! I will admit that I think I need to put a pause on Seriotypes using blue, purple, or blurple as a base. There are so many other colors to play with, and I need to travel outside of my blue, purple, aqua, pink comfort zone! Now that the weekend is officially here, I've got a couple things I desperately need to accomplish! My hair needs to be dyed, I desperately need a Pedicure, and if I do that, I'm gonna have to paint my nails again. Rainbow Honey's bath tea is calling my name. And that's just tonight! Tomorrow, it's a day of running around and doing errands, cleaning, church on Sunday, and a whole lot of playing with Peanut! Happy, Happy Friday to you!!! What fun things do you have planned?!? September is just around the corner, and that means that it's time again for the 31 Day Challenge! The prompts are broken down into three groups. One prompt each day for 31 Days. The final manicure culminates the entire challenge on October 1st. Last year was the first year I participated, and I'll admit, it's a challenging Challenge! I finished a couple days past the deadline, but I'm still really proud that I made it through and finished every prompt. 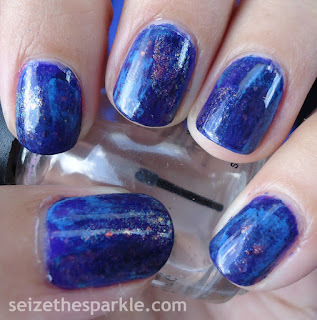 Especially that dreaded watermarble. This year, I've got stamping plates to play with, so that's definitely going to help me out a LOT. I grabbed a small set last year to help with my pattern manicure, but it only came with 2 plates. (The stamper was and still is ah-mazingly squishy and wonderful!) I ordered a bunch of plates after that, so I think I'm set for some of the more challenging prompts this time around! Last year, my goal was simple. I just wanted to complete each prompt, no matter how long it took. This year, I'm going to challenge myself further and try to finish on time. But I'm not really going to stress over that. I'm the mama of an almost threenager. Anything can happen! In addition to completing the prompts on time, I'm trying to up my nail game a little bit. Like last year, (with the exception of one day) I'll try to use at least two polishes in each manicure. I'm also going to use untried polishes as much as possible. I made a really big dent in the number of my untried polishes last year. It's amazing how quickly that number grows again, though! Fishbowl Fridays are still going ahead as scheduled. I'll be pulling a prompt and combining that with the #31DC2015 prompt for the day. It's definitely going to make Fridays a little more of a challenge during the month of September! But that's part of the point, you know? 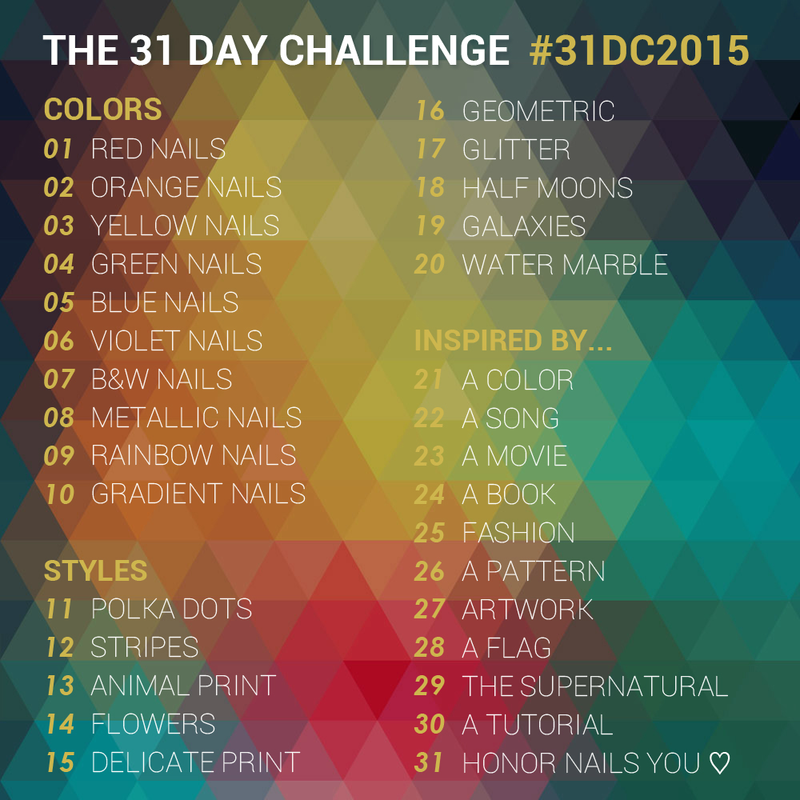 Will you be taking the #31DC2015? On Wednesdays, pink is usually the last color I end up wearing on my nails. So today worked out nicely! I needed something a little girly and a little sparkly. 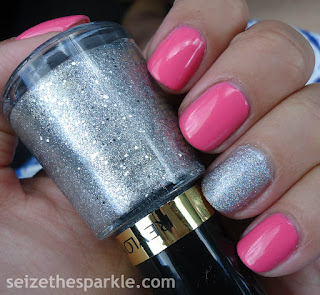 I've noticed that pink nails with glittery accents are my girly go-to manicure. 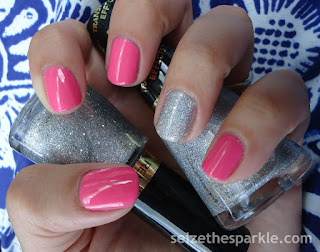 But I'm constantly finding new pink polishes to try, and this time is no exception! La Vida Polka has been sitting in my stash for a little while. I think I bought it for Peanut and then she decided she didn't want to sit still for nail painting. It was part of the Xtreme Wear Color Xpression collection from earlier this Summer. Application wasn't bad, just a little frustrating. I kept seeing bald spots that I thought needed fixing. Finally, by the 4th coat, I was pretty happy with how everything looked, but there was a definite hope that La Vida Polka would settle out upon drying. Thankfully, that's exactly what happened. 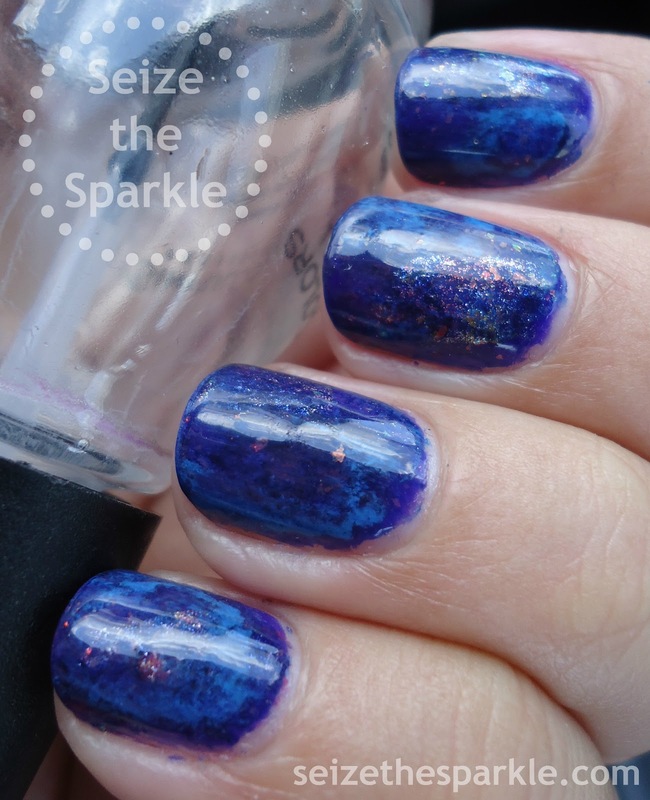 For my accent nails, I started out with a base of Out of this World and realized it was a little more sheer than I remembered. I switched gears and painted on a coat of Revlon Diamond Texture and was really surprised at the amount of coverage. Definite one-coater. Also, it's an all-silver version of Zoya Tomoko. I've instantly fallen in love! I topped that off with two layers of Holographic Pearls, then added a coat of Seche to smooth everything out. There's just the slightest bit of grit to the touch on my accents. Funny story about Holographic Pearls... The other night, I was wishing that Mirrorball didn't have those slightly larger pieces of glitter in it when I thought about Holographic Pearls. Convinced that I had bought it months ago, I fruitlessly searched my stash. Nope. Have you ever done that? So, when I went to CVS the other day, I picked up a bottle along with Diamond Texture because I had a coupon for $3 off $9 worth of Revlon. Score! I feel like it's been a while since I've had a drugstore find like Diamond Texture. Back in the day, you couldn't avoid displays of new, limited edition polishes. Now, they're fewer and further in between. I don't want to say that it's the end of an era, but it sure feels that way, and it has for a little while. I know I can't be the only one to notice! I mean, it's great that with accent manicures, layerings, and nail art, there are a zillion ways to combine what you have and make new looks... but I miss the hunt! I love black nail polish. It's been my Fall/Winter neutral for a really long time. The color to wear when you have absolutely no clue what color to wear! I've got a couple in my stash with different finishes. 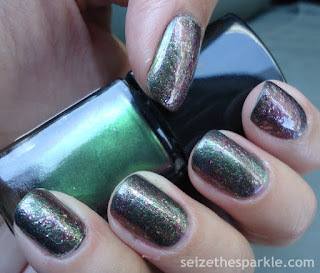 This one is a great mix of metallic edge and shimmer! Part of Wet n Wild's Here's to the Wild Ones collection, Keep Vinyl Alive is an almost-black metallic shimmer. 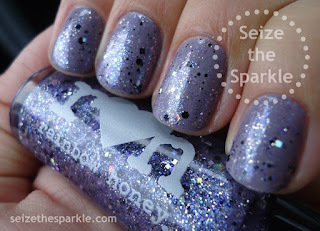 Up close and in photos, you notice the shimmer, but not so much in real life. 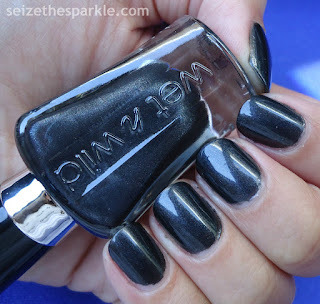 Looking down at my nails as I type, they read as a very shiny dark graphite. Keep Vinyl Alive went on nicely. It was opaque in two coats, but I added a third to smooth out some lines and make extra sure that there weren't bald spots. While I do like this shade, I'm not totally over the moon about it on its own. I'd love to see it mattified, because I think it might gray it down a little bit. It would probably also work really well in a Seriotype. Shimmery polishes usually do. I'm definitely excited to give that a try. 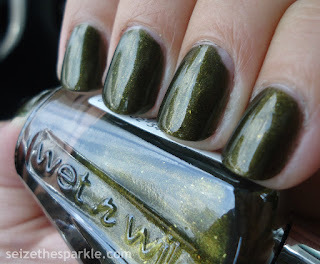 I am not normally the biggest green polish fan, but this metallic mossy olive green from Wet n Wild? It's gorgeous, and it really does glow! This just might be my new favorite neutral for Fall... and Winter. 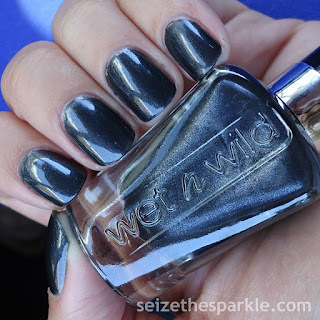 I Moss Have It is part of Wet n Wild's Here's To the Wild Ones collection for Fall 2015. I just read a post about these polishes on Nouveau Cheap late last week, so I was a little surprised to find it at my local Kmart. This time around, I remembered to take a picture of the display before I transferred one of each shade into my shopping cart. I tried to take a picture of all six polishes on my newly cleaned off nail desk last night, but between the glowing of the polish and the glare of the lamp, it just didn't happen. Stop and Mel-the-Roses, Pop-Up Bluetique, and Thrift Shopaholic were especially vibrant! I can't wait to try them out! Application was really great. The Mani-Curve brush really makes clean polishing easy. Between the width of the brush and the curve at the tip, it's much easier to keep a clean line at the base of my nail bed! I probably could've stopped at just two coats, but I saw a little streaking at odd angles. That can translate weirdly with photos, so I added a third coat to be on the safe side. 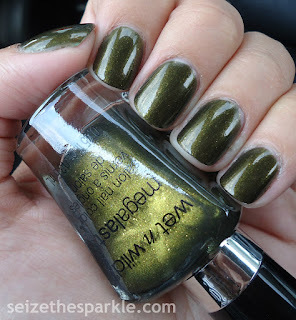 I Moss Have It is packed with a shimmery metallic olive that's so on point for Fall. There's also just a hint of amber and gold shimmer to give it incredible depth and sparkle. I'm not trying to give up on Summer and bright colors, but the vampier Fall colors are just so novel and tempting right now! As much as I love, Love, LOVE this color... It's off with it tonight and on with something else. But I can definitely see myself coming back to this polish again and again. Olive green has always been a neutral in the fashion world, so it's nice to see that same love happening in the beauty realm. With lots of added sparkle, of course! I finally pulled a gem prompt for Fishbowl Friday! 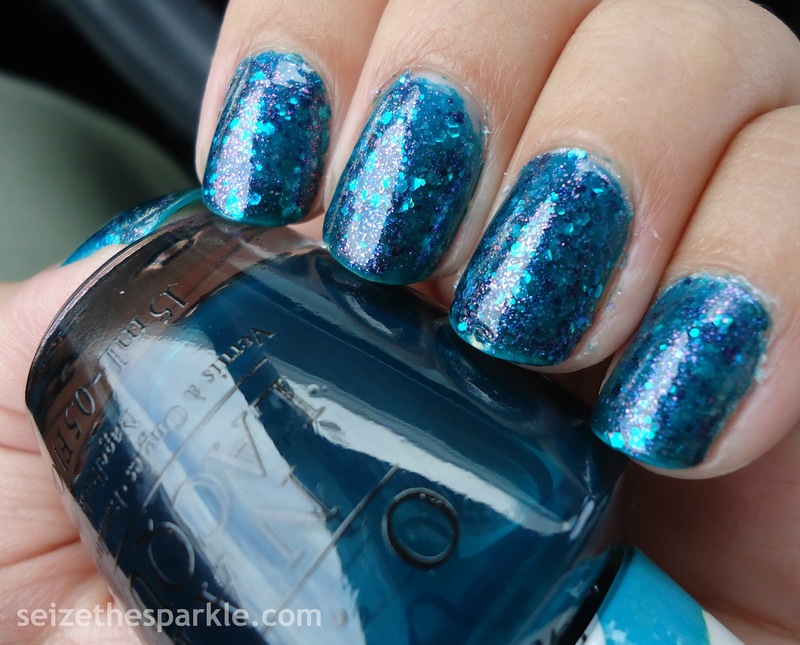 When I first created the fishbowl prompts, I included birthstones and a couple of other gemstones I thought would inspire fun manis! 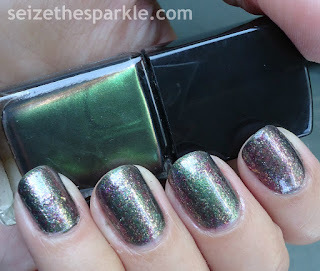 This one is especially special, because it happens to be Peanut's birthstone... TOURMALINE! Technically, Peanut's birthstone is Pink Tourmaline. My manicure is not only TOURMALINE inspired, it's specifically watermelon tourmaline inspired. Look the stone up if you get a chance. It's a mix of a warm, bright pink that gradients to clear and comes back up to a light olive green. So pretty. Emerald Blaze by Cover Girl probably would've fit the prompt well enough on its own. It's a medium olive green duochrome that flashes pink. But it's not a strong flash. 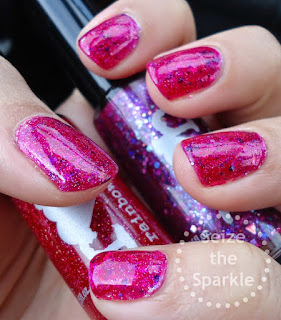 So I added pink shimmer with Sweet Candy from n.y.c. Then I painted on a coat of The Master and dabbed it with saran wrap. I repeated that same process with Lucky Charming, Sweet Candy, and Emerald Blaze. That was topped off with a coat of Sweet Candy, a coat of clear, and finally, a coat of Seche Vite to lock everything in place. Overall, I love the way this layering turned out. It looks so much better in real life than it does in the photos though, and that's a little irritating. My pictures make the green darker and the pink sort of turned red. Trust me, I wasn't going for a Christmas seriotype, but somehow it happened! C'est la vie, n'est pas? Not sure if I'm going to take this off or if I'm going to paint something else on my nails tonight. I really like this layering and I wouldn't be opposed to wearing it for another day or two. Plus, I'm trying to get a head start on some weekend projects tonight. I've got a pantry that needs to be cleaned and organized and there's not much more of the sparklestash left to put away. (YAY!) So, whatever your weekend plans, I hope it's a great one... Happy Friday!!! P.S. Just a quick note, I finally signed up for Ipsy today. I've gone back and forth on subscribing for an embarrassingly long amount of time now. Have you been thinking of signing up? In the interest of full disclosure, I do get points if you use my referral... Ask me in a day or so what those points get me. I'm not sure yet! At $10/month, I really don't feel bad about subscribing. Pretty sure I'll be posting about my inaugural bag, too. While I was brainstorming how I would layer Night Owl, I originally thought navy blue or black, possibly even a really dark purple. 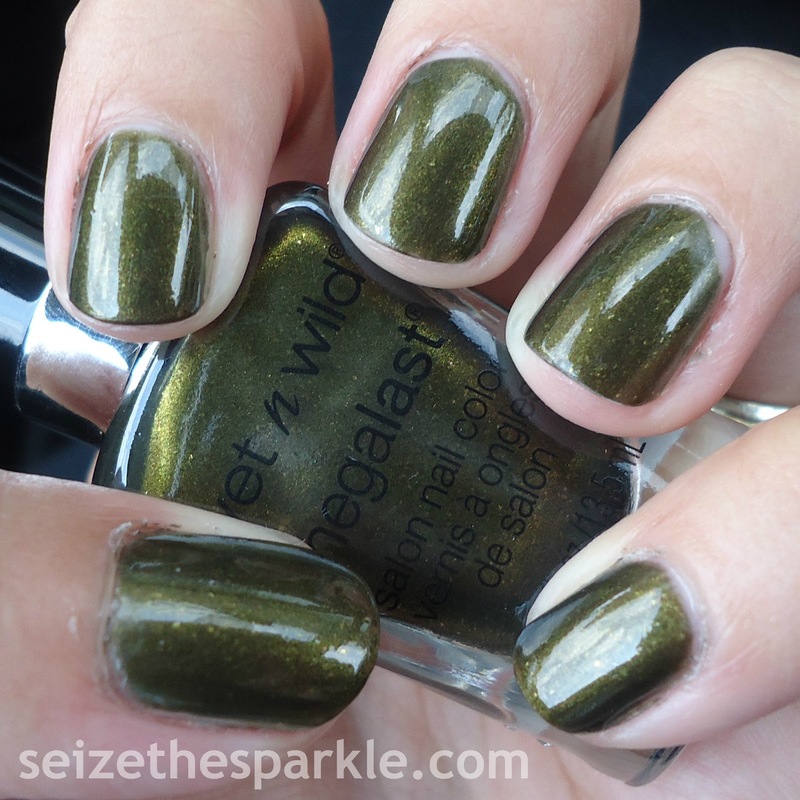 I've been dabbling in more fall-like colors, but I just couldn't do it with this one. So, I chose the amazing bright cobalt blue-ness of Most Sinful. Just like the other 3D glitters in the All Nighter Collection, Night Owl is made up of opalescent hex and bar glitter mixed with opalescent flakes inside a sheer lavender base. 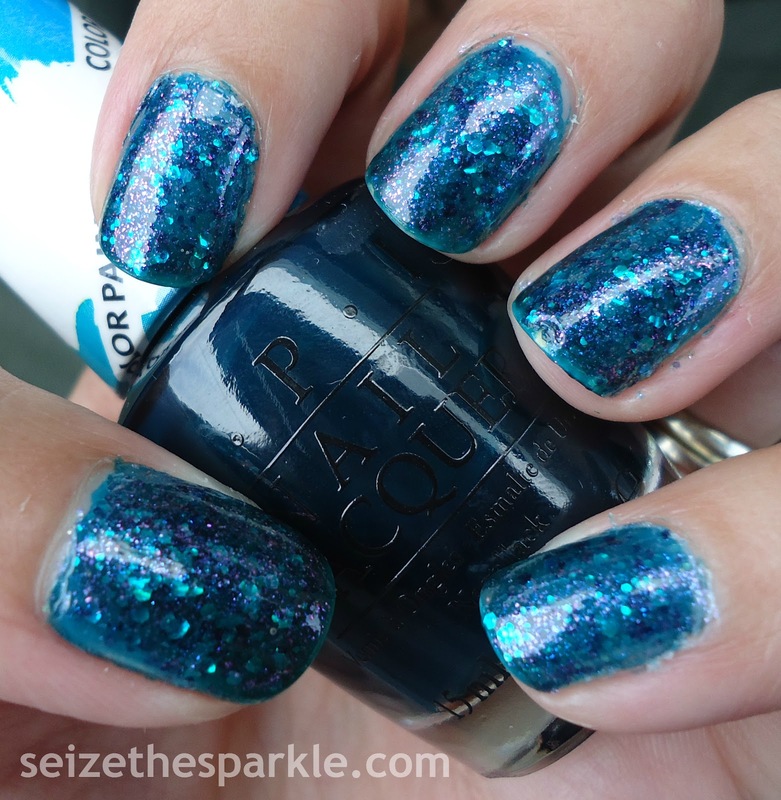 Glitter payoff was excellent, just one coat gave me full coverage (and sparkle!) on every. single. nail. 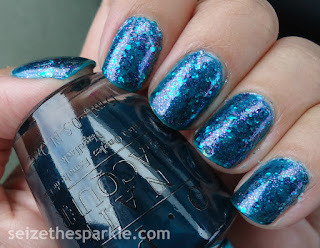 Night Owl is part of SinfulColors Class Act All Nighter Collection. You can find it on display at Walgreen and other mass retailers for $1.99 a bottle. The full All Nighter Collection also contains Blue Sensation, Casablanca, Daredevil, Fig, Glass Pink, Ice Dream, Late Night Haute, Purple Diamond, and Sinful Sunrise. Follow SinfulColors on Facebook, Instagram, and Twitter! Black nails are always edgy. 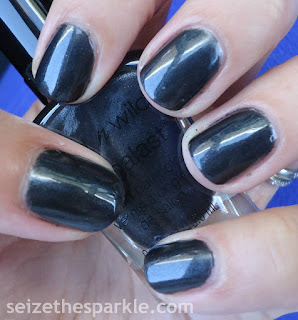 Black matte nails are somehow edgier and soft all at the same time. Out of all the Demi-Matte polishes in the Chalk Board Diaries Collection, Blackboard is definitely my favorite. Just look at that finish! 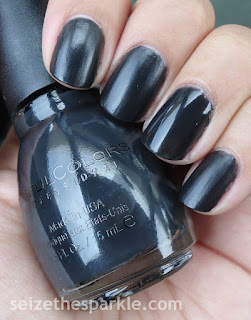 In the bottle, Blackboard looked like a really dark charcoal gray, but it's the demi-matte formula that makes that illusion. The Demi-Matte finish was definitely made for this shade. Application was great, too. Very little streaking, and that all evened out at the second coat. I added a third just to be sure I wouldn't have any visible streaks upon drying. Like the other Demi-Mattes I review, I added a clear coat and Seche Vite to an accent nail so you could see what Blackboard looks like all glossed up. To me, it almost looks like a jelly. Oddly enough, I prefer the matte look on this one, because it is such a soft matte finish. It's got a great luxe leather sort of look to it. I'll definitely be wearing this one again! 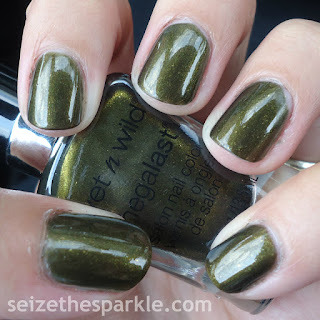 Blackboard is part of SinfulColors Class Act Chalk Board Diaries Collection. 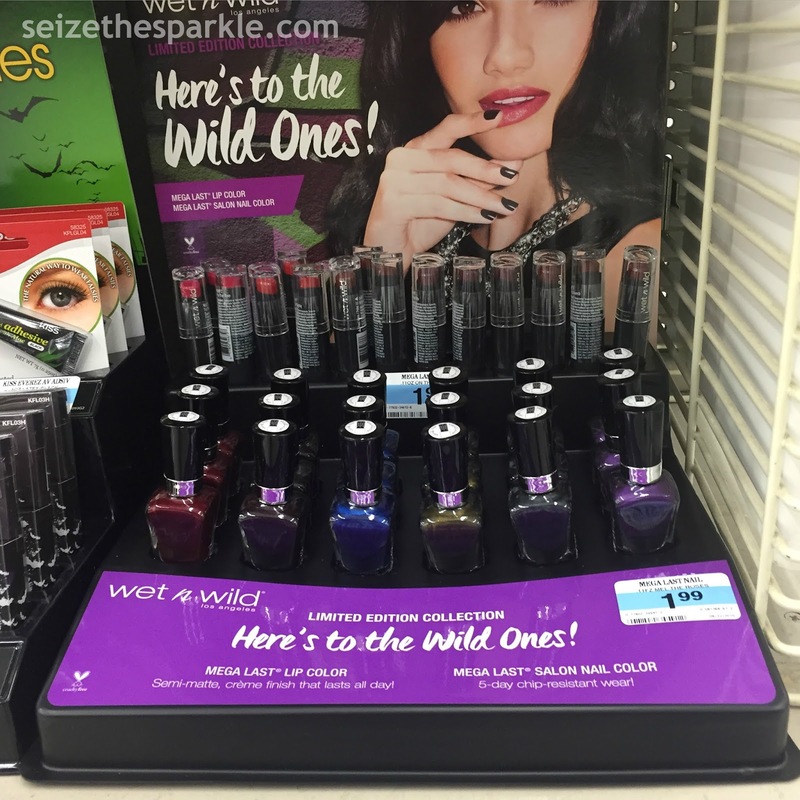 You can find it on display at Walgreens for $1.99 a bottle. The full Chalk Board Diaries Collection also contains A-Crush, Black on Black, Chalk It Up, Hazed, Pink Break, RADiant, Truth or Lavendare, V.I.Peach, and Whiteboard. Follow SinfulColors on Facebook, Instagram, and Twitter! When I first tested this polish out on a swatch wheel, I think I must've been half asleep or using a different polish. I had the idea in my head that it was really sheer, more along the lines of a sheer topper. Thankfully, I tested it out again before using it in a layering and found that not only did it have a lot of shimmer, it had great coverage. I quickly scrapped the plans to layer it so Purple Diamond could shine all on its own! Application was great, Purple Diamond was easy to manage with very little cuticle pooling while polishing. I probably could've stopped at three coats, but I was a little worried that my yellow tips might show through. I always prefer to err on the side of one coat too many rather than one coat too few! I really love this shade of lavender. It's a really feminine shade, and the shimmery glass-fleck finish adds a lot of fun! So much so, I actually wore this for two whole days, which rarely happens! 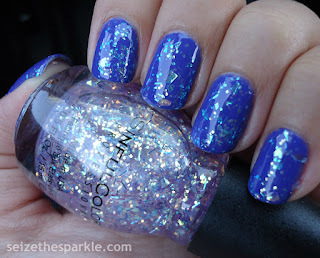 Purple Diamond is part of SinfulColors Class Act All Nighter Collection. You can find it on display at Walgreen and other mass retailers for $1.99 a bottle. The full All Nighter Collection also contains Blue Sensation, Casablanca, Daredevil, Fig, Glass Pink, Ice Dream, Late Night Haute, Night Owl, and Sinful Sunrise. Follow SinfulColors on Facebook, Instagram, and Twitter! When I sit down to paint my nails, there are times when my vision works out and translates correctly on the first try. Then, there are times that I get way too many layers going or really don't like the finished product. Last night was a combination of the both of those, with a little bit of old, gloppy formula and poor color choice mixed in. Thankfully, version 2.0 turned out much, much better! For the past couple of weeks, I've been wanting to do a mermaid inspired manicure. Not gonna lie, several attempts never saw the light of day. Some attempts turned into something completely different. This particular layering is version 2.0 from last night, and I'm really happy with how it turned out! Starting out, I knew that I wanted to use mainly turquoise and purple. I wanted a mermaid vibe and kind of had a jelly glitter sandwich in mind. The first time around, I actually used Turquoise Aesthetic to top off my layering and to test the jelly glitter sandwich capabilities. I was pretty surprised that it turned out as well as it did. However, that was layer 10 or 11, and my nails were turning into a gloppy mess. I started over and simplified my layering, sticking to just 3 polishes to create this super sparkly turquoise jelly glitter sandwich. Now that I've seen Turquoise Aesthetic successfully pull off a jelly glitter sandwich, I want to try the rest of my Colorpaints! Initially, I had written them off as being too pigmented for that sort of thing, but this layering turned out perfectly! Sadly, as much as I really do love this manicure, there's a tiny bare spot on my ring finger that I just can't leave on for another day. It's back to the drawing board, or I guess in my case, the nail desk!